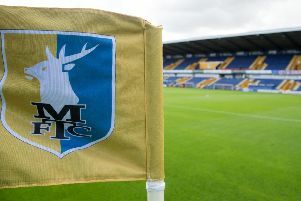 Mansfield Town boss Adam Murray has not given up in his search for an extra striker ahead of Thursday night’s loans deadline. Murray was hoping to bring in one of two Premier League U21s on his radar before last weekend. But the deals failed to be completed as did a couple of other possibilities for more experienced players who had already done the business in front of goal. However, Murray is still hoping to tie something up in time for the Good Friday trip to Wycombe. “We were hoping it was going to be done for the Portsmouth game,” he said. “But to be totally honest and up front, we lost two on Friday – one from a Championship club and one from a League One club. “They were proven goalscorers and obviously at this time of the season they are tough to get. “We have one lad from the Premier League – a young lad from the U21s – we are hoping we can get this week. “It would give us extra firepower and help for this team. We want to finish as strongly as we can. “I have to give credit to the chairman. He has backed me and said go and get what you need to improve it in the last nine games. Last week Murray brought in Chesterfield striker Mani Dieseruvwe on loan and he made an impressive debut in Saturday’s 1-1 home draw with Portsmouth.